Today is Part 2 of 4: Album breakdown, opening and closing songs, and the full song list and more. Part 1 can be found here. *Tracks has 66 songs, 58 of which are “exclusive” to that collection. The most represented album was Wrecking Ball, with songs from that album performed 766 times. 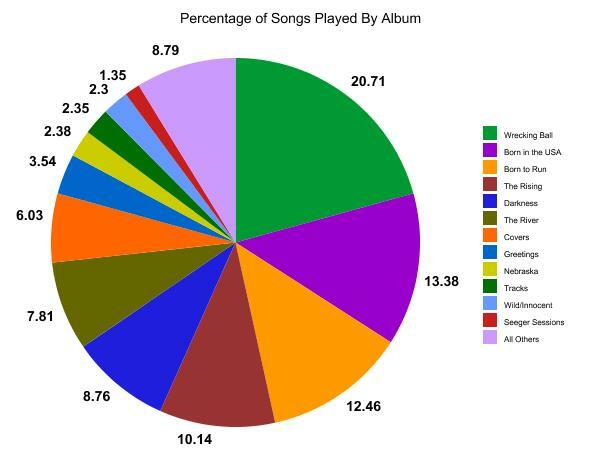 The least represented album was Devils and Dust, with only 6 performances of songs from that album. The songs played from Tunnel of Love, Human Touch, Lucky Town, Devils and Dust, Magic, Working on a Dream and The Promise combined represented only 3% of the performances on the tour. On the 2012-13 Wrecking Ball tour, new material made up 20.71% of the songs played. On the 2009 Working on a Dream tour, new material made up 10.35% of the songs played; on the 2007-08 Magic tour, 27.76%; on the 2002-03 Rising tour, 39.34%. 1. Bishop Danced, played May 2, 2012 in Newark. 2. Man at the Top, played July 28, 2013 in Kilkenny. 3. Secret Garden, played July 24, 2013 in Leeds. 4. Lion’s Den, played April 6, 2012 in New York. 5. Take ‘Em As They Come, played July 14, 2012 in London. Thunder Road is the only song that was used in all four spots (a show opener, main set closer, encore opener and show closer) on the tour. 77 songs were played only once. 23 songs were played only twice. Only 15 songs were played at more than half the shows. 162 of the songs played were written/co-written by Bruce Springsteen. 1. Where is “This Land is Your Land?” Why is the Apollo Medley counted as one song instead of two? I used Brucebase standards. No partial songs (This Land is Your Land, Not Fade Away, etc.) Just like the “Detroit Medley,” the “Apollo-Medley” is counted as one song. Brucebase didn’t count “Green Onions,” which was played by the band when Springsteen collected signs on September 2, 2012 in Philadelphia. I might personally disagree on that song but it was easiest to stick to one standard. 2. Where did the numbers come from for show attendance? Billboard Magazine’s “Boxscore” attendance reports. Note that not all festival attendances were reported. The top 3 spots (Roskilde, Rio de Janeiro and Lisbon) are estimates only. They were almost certainly the largest crowds of the tour but exact figures are not available as they were for the other shows. 3. What about the show lengths? The proper methodology for timing of shows was previously discussed in this article. Show length ranking was based off timing done at the show and was subject to confirmation with show recordings. Acknowledgement: Thank you to Victor Beyer for error-checking the numbers. This entry was posted in Tour Wrap-Up. I think “Solo le pido a Dios” could be included as a part of the Tour …It’s the only post show song ? ?